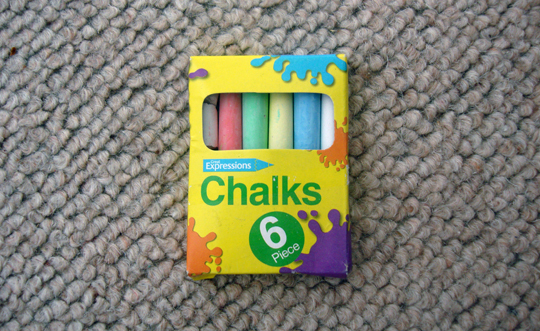 Saturday Competition: Win these chalks! I very much enjoyed reading through all your wonderful competition entries when I gave you the chance to win those Source Code posters the other week. I haven’t had time to organise a proper prize this week but didn’t want to stop you being creative, so today I’m giving you the chance to win the packet of chalks pictured above. You will also receive a certificate of authenticity confirming you as the rightful owner of the chalks. To be in with that all important chance of winning, just tell me what you plan to draw with the chalks if you win them. Warning: you will be required to fulfil this commitment and send pictorial proof upon receipt of your prize. Good luck!